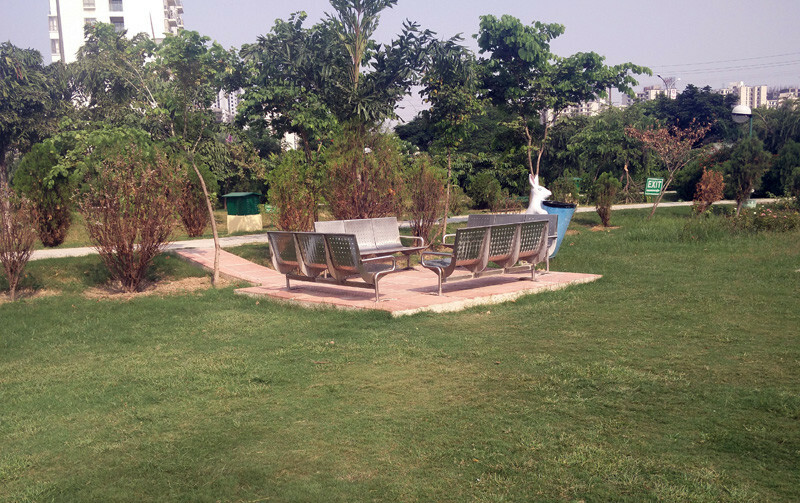 Deep in the heart of Noida resides this abode of serenity. 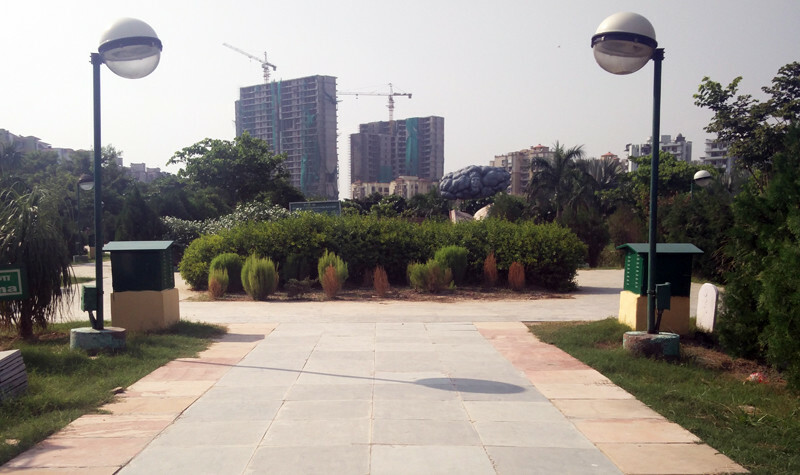 The lanes of Sector 50, crossing the multiple resident welfare associations, make their way towards a different altitude of a lush green environment. With every step towards the park, a sense of solitude begins to surround, both metaphorically and literally. Within a span of minutes, one frees himself from the cobwebs of city life and is lost in the luscious green glimpse of the park. Everything becomes tranquil, it’s like a treat to one’s senses. The noises, which were agonizing every neuron in the brain are now converted into comforting sounds, soothing every bit of the soul. No matter what the season is, no matter what time of the day it is, there’s a sense of sweet air flowing all over. 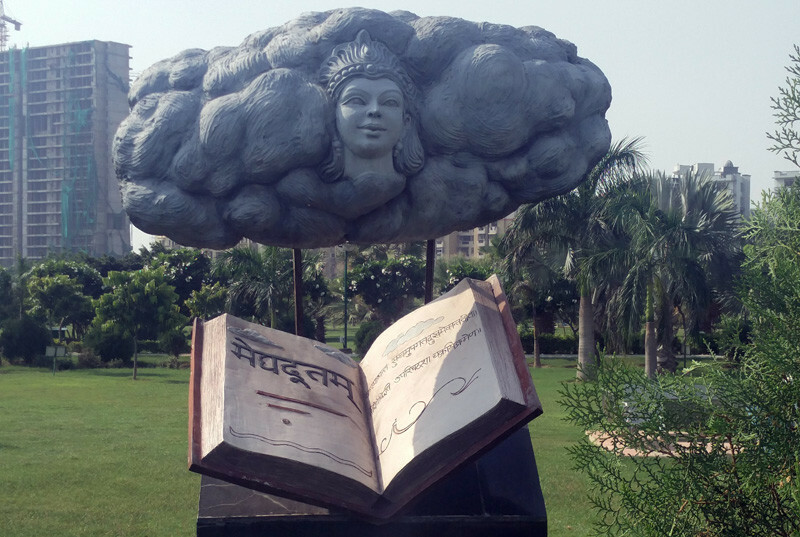 It’s as if Lord Meghdootam (the cloud messenger) is Himself keeping an eye over it. 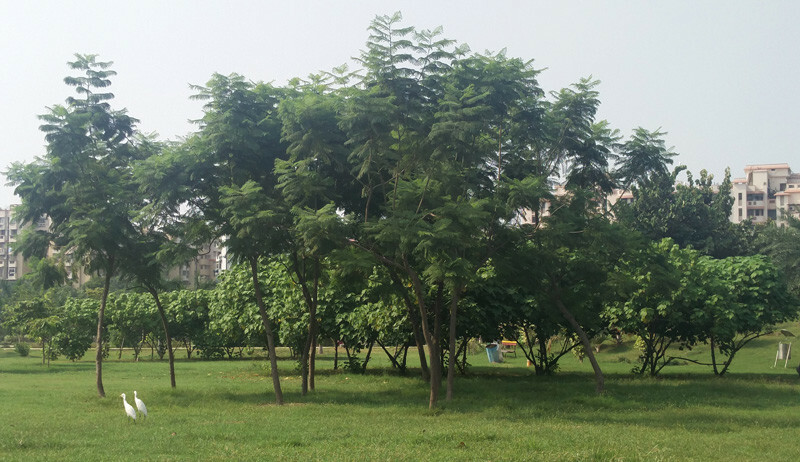 Meghdootam Park is also famous under the local name of ‘D Park’. This is because, if taken an aerial view, it looks like a giant D. The horizontal length of the park acts as an entrance from the different societies surrounding it. 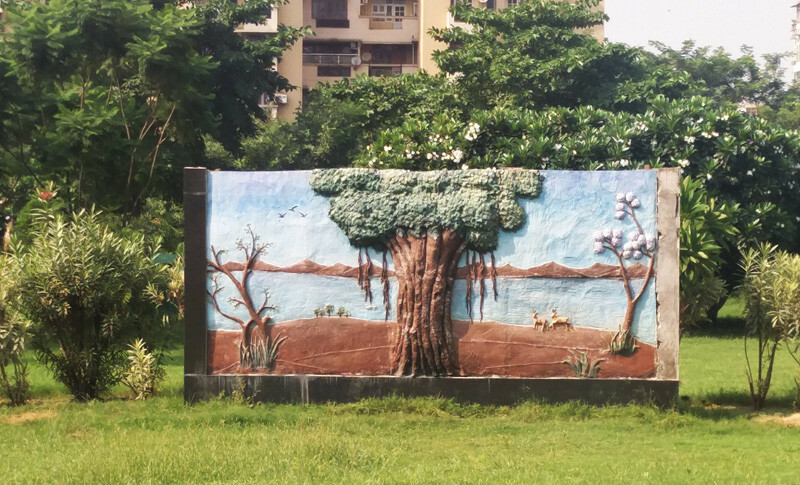 The lush green surface has been maintained in a pristine manner, making the landscape a sight to behold. 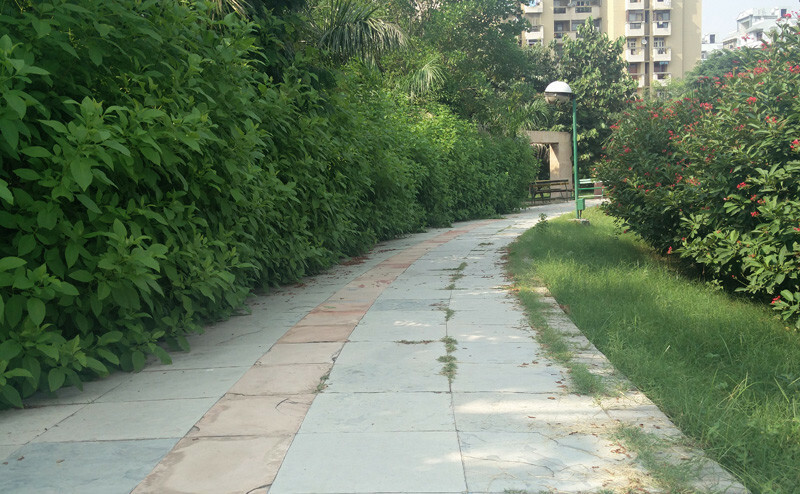 There’s a network of tiled paths that run all over the park, giving joggers a perfect place for their running spree. These paths are bounded on both sides by unique shades of flowers and other flora, mesmerizing the thoughts of anyone who happens to run by. At random places, small elevations are made to look like plateaus, giving the structure a distinctive edge over other parks of a similar nature. There are small tomb-like structures evenly spread around in the park where people can sit and relax and admire the environment all around. 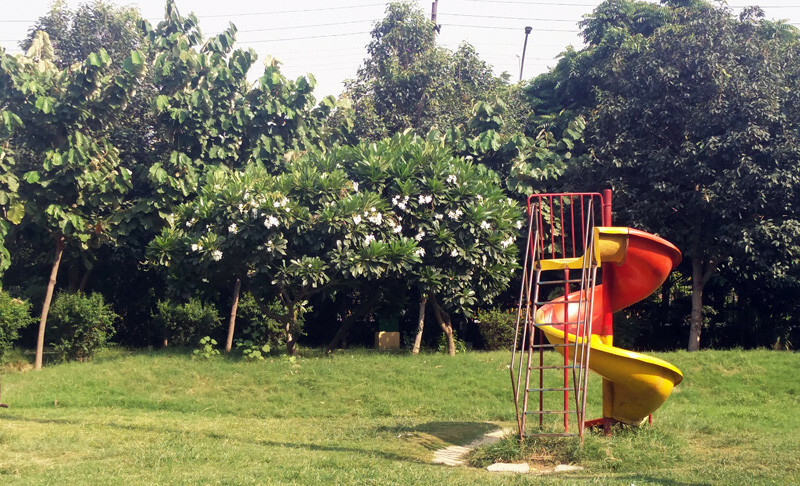 These structures generally witness elderly people, some cribbing about any random topic they can think of, some laughing away all the worries and fears away and enjoying every moment presented in front of them. The park starts its mornings as early as 5 AM, enthralled by the echoes of the joint laughter of people who run a laughter club there. A few people took the step of forming a Yoga club for which admission is free for all. A routine of long walks for an hour, followed by the kapalbhati and different asanas, as instructed by the Yoga guru and ending in bouts of laughter is the scenario every morning. By the time the sun is fully up and bright, the park is already occupied by fitness enthusiasts, couples starting their day with a good walk, the children who accompanied them, swirling away on the swings, high-level acrobats in amazing acrobatic positions leaving your minds twisted and twirling, few aged people lost in their newspapers analyzing the situation of our country and also sharing words of advice. This place acts as a brilliant platform for varied activities. Those having interest in theatres/plays/acting are also taken care of. There’s a small amphitheater where one can gather one’s own audience and perform. Apart from yoga, kids up to the age of 9 years can also enroll themselves in the Taekwondo classes at a very decent fee. The guru introduces the kids to this form of art and gives them an amateur level of knowledge of its usage. Once in a week, the Taekwondo teacher also takes self-defense classes for girls and women, age no bar! Wow! A sense of happy peace can be achieved at any time of the day, but the highlight of this place is a visit at night! There’s ample lighting all around the park making it feasible to enjoy a good post-dinner walk. The halogen lights are methodically placed enhancing the beauty of the park and making it a spectacular view to be enjoyed. Amateur photographers are also slowly flocking to this place to intensify and elevate their skills towards their passion. Though nothing can beat reaching there via one’s own vehicle, one can also walk their way to reach this place from the Noida City Centre Metro Station, but we still it is suggest you take an auto or a rickshaw to reach here. The lanes of Sector 50 can be spooky at night! See you there?